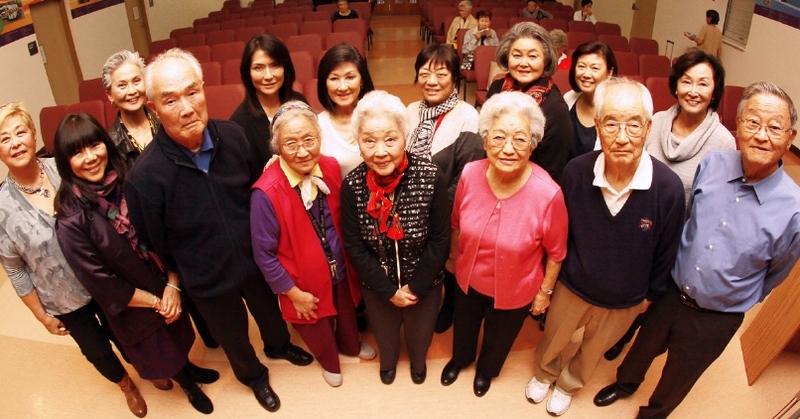 Front row from Left: France Wong, Stanley Kobayashi, Fujiko Yoshikawa, Sachii Kaneshiro, Cherry Ishimatsu, Katsuo Yamasaki and Paul Imahara. Second row from left: Carol Itatani, Helen Erickson, Dulcie Kawata, Sandy Toshiyuki, Joyce Chinn, Dianne Hamano, Frances Matsumoto and Faith Ono. 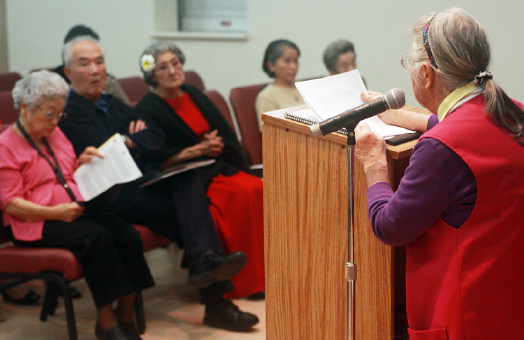 The Keiro Remembrance Writing Project had a book party on Nov. 28 to celebrate the printing of Booklet II featuring stories of Sakura Gardens residents Paul Imahara, Cherry Ishimatsu, Sachii Kaneshiro, Stanley Kobayashi, Katsuo Yamasaki and Fujiko Yoshikawa. The afternoon tea and presentation in the Recreation Hall included readings from the writers’ stories. Class member Kobayashi and class leader Dr. Carol Itatani entertained an audience of about 40 persons by playing piano. Naomi Takara performed a hula with an ukulele accompanist and Haruko Tsukayama, a class member from last year, sang in Japanese. At the podium, Fujiko Yoshikawa; in the audience, from left: Cherry Ishimatsu, Stanley Kobayashi, Naomi Takara, Haruko Tsukayama and Helen Tokeshi. The writing class is sponsored by the Nikkei Women Legacy Association (NWLA) and led by Itatani, its vice president. The class is free and Semester III will resume in January. It meets on the first and third Mondays of each month. NWLA member Joyce Chinn helps with Japanese-speaking participants. The class writes original essays and life stories shared at each meeting. Participants say the writing process helps to keep their memories in order and minds engaged. This is the Keiro Writers Remembrance Project’s second year. NWLA’s Dulcie Kawata has put the stories into a booklet. The writings provide a unique window and treasured account of life experiences, and serve as a record for the writers and a memento for their friends, family and generations to come. This year’s booklet was endowed by an Aratani CARE Foundation grant. Copies of both Keiro Writers’ Remembrance Project booklets are kept in the UCLA Asian American Studies Center’s archives.